Before you ask ‘what kid-friendly Fitbit is best for my kid?’, or ‘should my kid wear a fitness bracelet?’, let’s talk about the importance of fitness and technology in the year 2018. Fitness trackers are more necessary than ever before, especially in regard to kids. Why? Because we’ve entered a new age of people glued to their technology, and it’s important that kids understand the value of getting active via exercise or sports. The original Fitbit was founded in 2007, and only 10 years later has the “Fitbit for kids” craze truly begun. In the year 2018, kids are surrounded by screens of all types: phones, TVs, tablets, and now even virtual reality. And although there is a great benefit to all of this, including great fitness apps for kids, there seems value in limiting screen time while making the best of the technology available to us. Are kids being overloaded with information via technology? UNICEF Kid Power has developed Kid Power Bands, in an effort to accomplish two things: help kids stay active, and also help kids around the world. This way your kid can be getting active and having fun, but also helping change the life of a severely malnourished child for better. The Sqord Activity Tracker is interesting is it doesn’t bill itself as a step tracker but rather as a “play tracker”. The website states: The Sqord Activity Pod isn’t merely a step-counter. It tracks all sorts of movement and converts it into points that connect to Awards inside the free kidSAFE-certified App. Sqord also has an app which lets you create your own character to play games with, and the more points you earn, the more fun and crazy things you can do with your character. This kids Fitbit-style fitness tracker is more of a play tracker, and could be good for younger kids. Remember Garmin? The former in-car GPS creators have pivoted to a wide array of tech products, one of which is a fitness tracker of sorts. This particular Fitbit for kids style product will track your steps, sleep, and additional physical activity. There is also an app which lets parents control the settings, which is a bit more interesting than you would think: the parental controls here will let parents force their kids to do chores! As from their site: (The app offers) fun and educational mobile adventures for kids and chore/behavior management for parents. The X Doria acts as a motivational fitness tracker for kids aged 5-13. So, if you want your kid to be a bit more motivated with his fitness and workout schedule, then this app is for you. The motivational aspect is explained as follows from the X-Doria team: (It) motivates through consistent encouragement and fun, challenging goals. This particular kids bracelet is splash proof and is one size fits all! 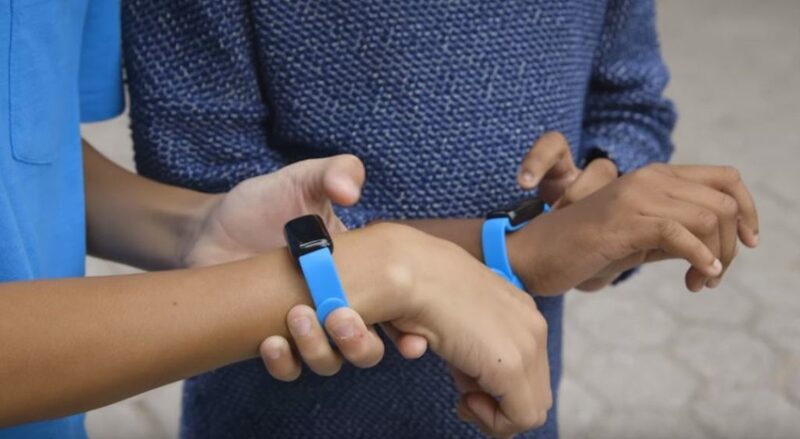 This particular kids fitness tracker is less known and has more to do with the health space, but it is interesting nonetheless for anyone looking for a kids’ bracelet to monitor physical activity. In addition to the basic fitness tracker specs such as time display and foot count, it also has a heart rate monitor, pedometer, and calorie burning counting. This tracker also offers email and phone connectivity to inform you if you receive an SMS or phone call. This app is unique in that it bills itself as a kids’ fitness tracker, but the specs indicate that most adults would certainly find this app useful. I suppose this app could be billed as a family fitness tracker app as opposed to just kids. Badges and gamification. Kid users will receive badge alerts and celebratory messages when they hit certain milestones and other statistics. Reminders. In case your kid forgets to be active for a while, the Fitbit Ace will send them a reminder message to get them moving! What Fitbit is best for kids? Officially, the Fitbit for kids model does not exist. Fitbit explains on their website that they do not have any formal fitness trackers for kids available for sale. And, more importantly, their Fitbit app will not work with any kids under age 13. However, if you have a kid who is 13 years or older, then they may want to check out the Fitbit zip, which we suppose can be considered a Fitbit for kids and/or teenagers. The Fitbit Zip makes sense for kids and teens because it is rugged and can withstand a lot of physical impact that many sports playing kids and teens will do. Also, this model utilizes social communication between friends and family for some healthy competition, and in the age of social media, kids and teens will definitely enjoy this Fitbit for kids style activity fitness tracker. Other Fitbits that may be popular among kids are the Flex 2 and Blaze, both of which are strong, tough, and comfortable wearables for kids. There was recent buzz that Fitbit will make their very first Fitbit for kids, as they were apparently feeling the heat from Apple’s foray into the youth smartwatch movement. The announcement of the Fitbit Ace confirms that. One of the major issues for parents is motivating their kids. As we linked to in the top of this article, the abundance of technology (which we’ll touch on in the next paragraph) is ironically hurting kids in their pursuit of being active and fitness. With tons of video games, app games, TV shows, movies, and many other reasons to never leave one’s house, a kid can sit in front of a screen all day long! That is why it is important to utilize technology to get kids going, and to show them the benefits. A wearable fitness bracelet is a cool ‘toy’ for kids to embrace, and is the perfect answer to fuse the latest technological developments toward a fitness-minded culture. Having your kid wear a Fitbit or Kid Power Band is one way to gamify the fitness experience, thereby making it interesting for kids. A fitness bracelet will likely increase the motivation for your kid to get more active. Whether you are deciding what Fitbit your kid should wear, or what fitness tracker app is best and most fun for your kid to use, it is important and helpful to embrace this newfound technology. The notion of fitness tracking for kids is a new one, but one that is slowly being embraced by parents, teens, and even kids these days. Technology has taken over society and is a prominent aspect in most kids’ lives. Of course, that doesn’t mean all is for naught: the fitness tracking industry, especially for kids, has taken off. With all the improvements in technology lately, whether it’s with virtual reality, machine learning, artificial intelligence, or robotic and drove advancements, we’re expecting bigger and better things from the kids fitness tracking industry in the coming years. Do you have any thoughts on the state of Fitbit for kids style fitness bracelets? Shoot us a message on our Facebook page! And check out our awesome gifts for kids guide for a ton of great kids’ gift ideas!